Book Summary: The Dark Lord of the Sith's unstoppable march continues! The natives of Shu-Torun are revolting, and there's no way the Empire will stand for that. 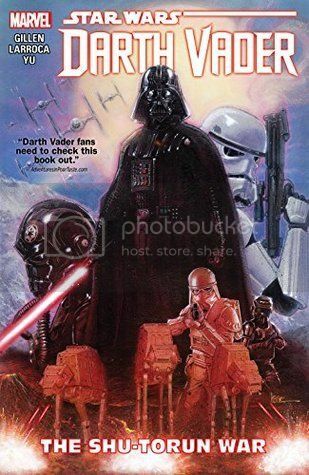 When Darth Vader is tasked with leading a military assault against the planet, could it be that his rise to glory has begun? But who will follow Vader into war? Would you? Then again, it's better to fight alongside Vader than against him. That's a lesson that the ore barons are about to learn. Collecting DARTH VADER #16-19 and ANNUAL #1. Whatever you do never ask Vader to dance. This comic series is set between A New Hope and The Empire Strikes Back. In this set, Vader has been tasked to bring down a rebellion in Shu-Torun. He has made Trios queen. For now, Vader will have to put aside his need to find the young Skywalker and focus the task at hand. With the twins and the evil counterparts to C-3PO and R2D2 in tow, Vader must prove himself to the Emperor but it won't be easy as espionage and double-crossing are added into the mix! Although I have loved this series, I felt this series did little to push forth. I suppose with the writers having to insure that it stays in-canon, you really don't have much to do with Vader except send him out to squash a rebellion, install a queen, and search for Aphra, who is currently MIA. Still Vader continues to remain one of the most badass villains to ever grace the screen and comic book pages. I have relatively enjoyed this series and though I am not a fan of this one, I remain loyal to his series.